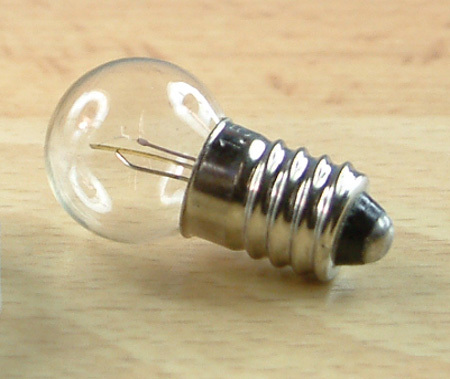 A sub-miniature filament lamp. Ideal for illumination. 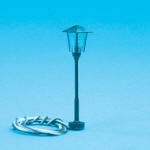 I have used these to produce street and building lighting, on model layouts to great effect. Dimensions 1.48mm long x 4.3mm diameter, pin length 7mm. Filament bulb available in either 6V or 12V versions. Suitable for any of the MES bulbs above. Ideal for use in a variety of modelling and circuit applications and comes with a 150mm leads allowing easy connection. 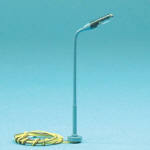 Ideal for use in a variety of modelling and circuit applications and comes with a 150mm leads allowing easy connection. 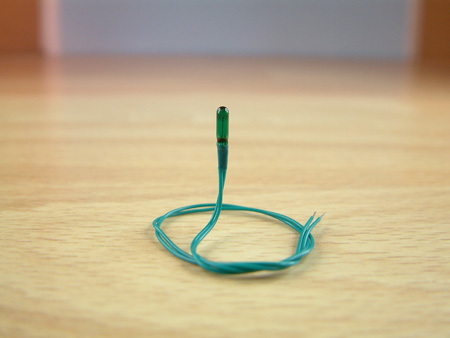 3mm diameter for 12v AC or DC operation. 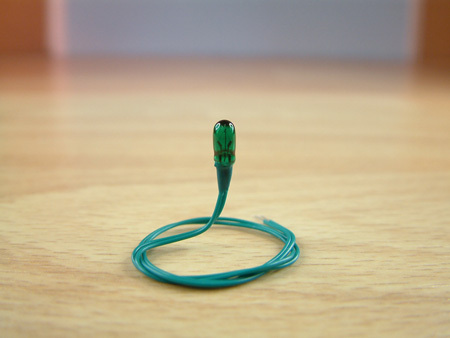 Ideal for use in a variety of modelling and circuit applications and comes with a 150mm leads allowing easy connection. 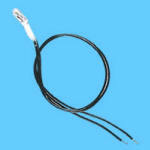 1.8mm diameter for 12v AC or DC operation. 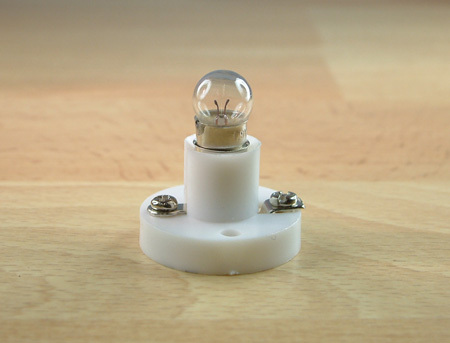 LED's require very little power, and produce little heat when compared to normal filament based bulbs and are Ideal to be run from a battery pack. 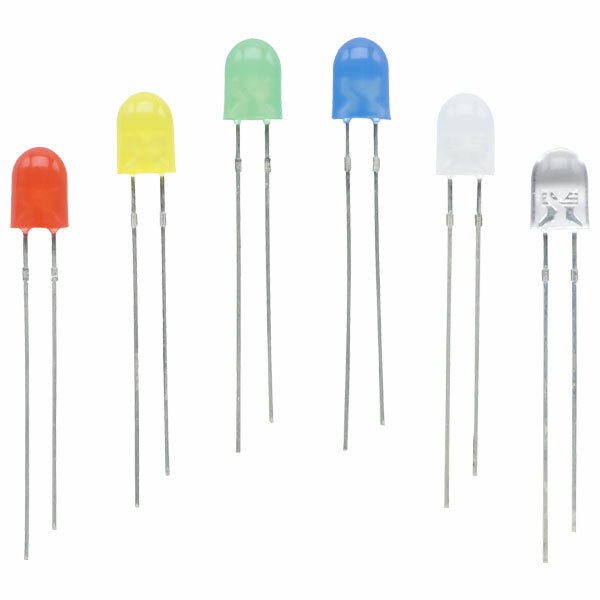 These miniature (5mm) LED's incorporate a in-built series resistor enabling the LED to be directly connected to a 5V or 12V (depending on purchase) supply lines without the normal hassle of fitting a resister. All devices are intensity and colour matched and housed in diffused coloured packages. Cathode identified by flat on body. These 5mm high power, oval LEDs feature a directivity pattern that is ideally suited to applications such as: traffic signals and portable light sources, signage and channel lettering, decorating and entertainment lighting, architectural lighting, small area illumination and back lighting. High power suitable for many applications, 5.1 x 4.3mm lens, Superior weather resistance, UV Resistant epoxy. 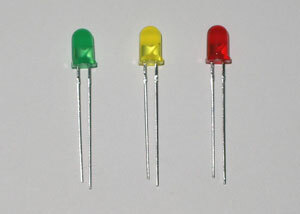 5mm Bi-Colour LED offering several colour options comprising two LEDs connected in inverse parallel housed in a milky white package. Voltage: 3.4v (30mA). 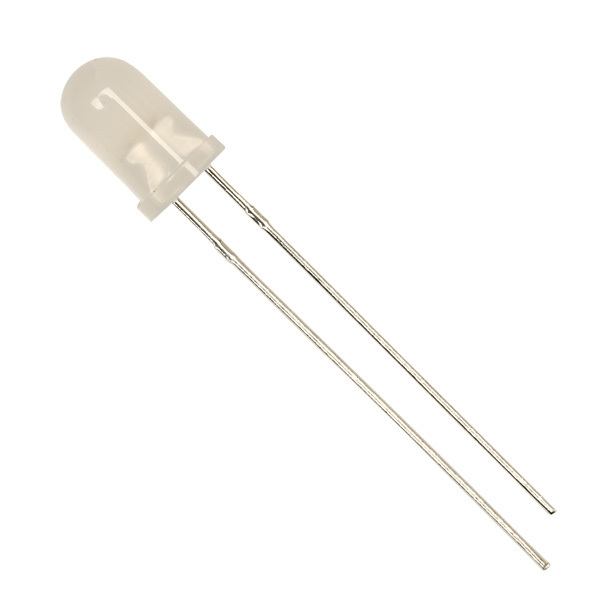 Note: An electrical resister is require when using this LED with a power source in excess of the voltage and ampage stated. High intensity white LED in a 5mm package featuring a blade cathode which acts as a heat sink to dissipate heat at high current levels. 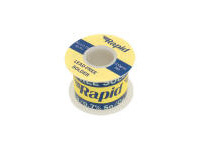 Suitable for automotive dashboard lighting and back lighting. Voltage: 3.3v (50mA). 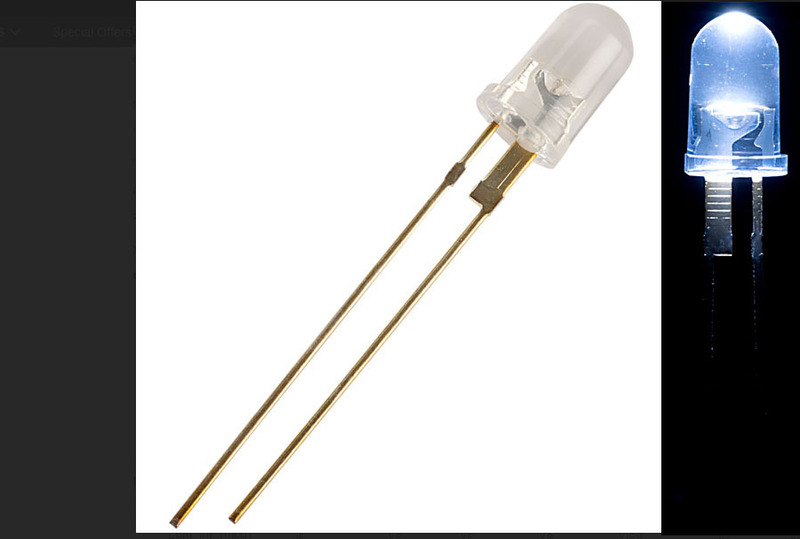 ●High luminous intensity (30000 mcd) for use in a wide range of indication and illumination applications requiring a high output. ● Manufactured using the latest technologies for long life, energy efficiency and high reliability. ● Suitable for PCB and panel mounting applications. ● Water clear lens. Note: An electrical resister is require when using this LED with a power source in excess of the voltage and ampage stated. LED's require very little power, and produce little heat when compared to normal filament based bulbs and are ideal to be run from a battery pack. 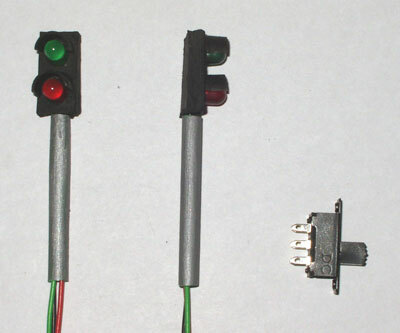 These miniature (3mm) LED's incorporate a in-built series resistor enabling the LED to be directly connected to a 5V supply lines without the normal hassle of fitting a resister. All devices are intensity and colour matched and housed in diffused coloured packages. Cathode identified by shorter lead. LED's require very little power, and produce little heat when compared to normal filament based bulbs and are ideal to be run from a battery pack. 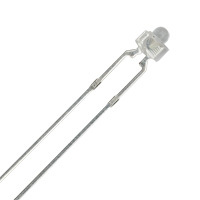 These miniature (3mm) LED's incorporate a in-built series resistor enabling the LED to be directly connected to a 12V supply lines without the normal hassle of fitting a resister. All devices are intensity and colour matched and housed in diffused coloured packages. Cathode identified by shorter lead. 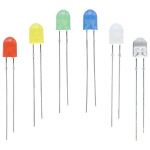 A range of industry standard 3mm round LEDs housed in a diffused coloured package. Requires a resistor in series to limit the current to a safe value. Use a 1k for 12V or less. see 1k resistors below. Flashing 3mm 12v LED lights. Available in Red Green and Yellow. Flashing 3mm LED lights. Available in Red, Yellow and Green. 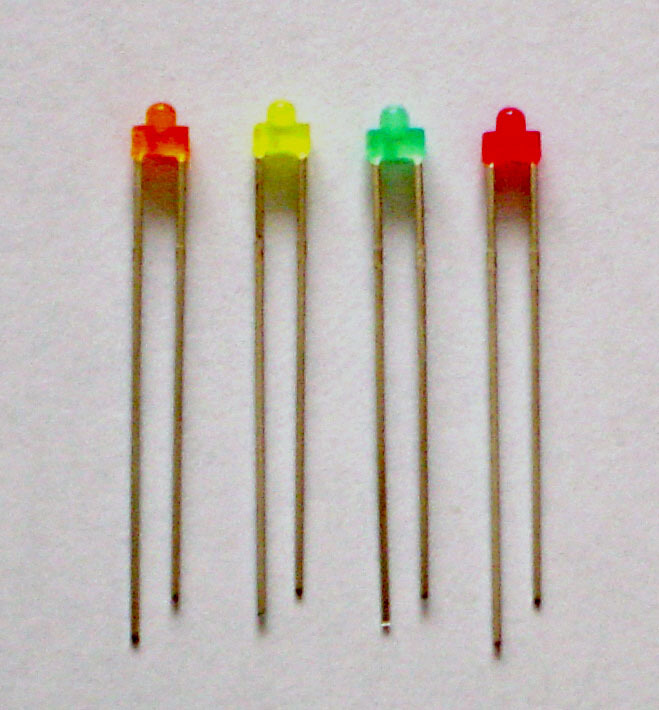 A 3mm LED with a in-built IC to produce a continuous flash at a frequency of 1.5-3Hz. 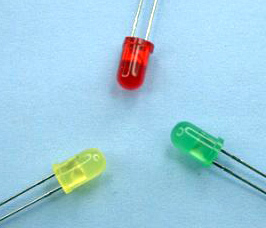 A range of miniature colour diodes in diffused package of 1.8mm diameter (Require a resistor for power over 5v 25mA). 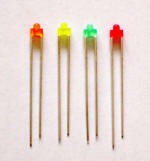 White LED in a 1.8mm water clear package (Require a resistor for power over 3.4v 30mA). 5mm two part panel clip. 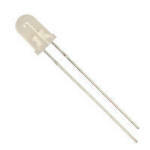 Suitable for use with LED without built in resister (eg 3mm LED above). 1 connected to a battery will protect all LED's connected to that power supply. 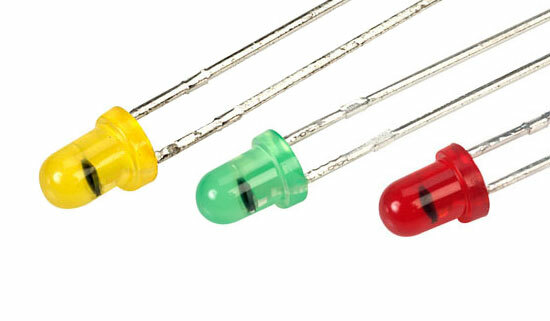 1W Industry standard high power metal film resistors coated with a red non-flammable lacquer which provides electrical, mechanical and climatic protection. A novel LED holder with 200mm leads pre-stripped and tinned which simply clips to the rear of the LED and is retained in position by a patented clamping device. The holder will significantly reduce assembly time and ideal if soldering is a problem. 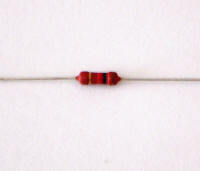 Dimensions 14.5 x 2.6mm. 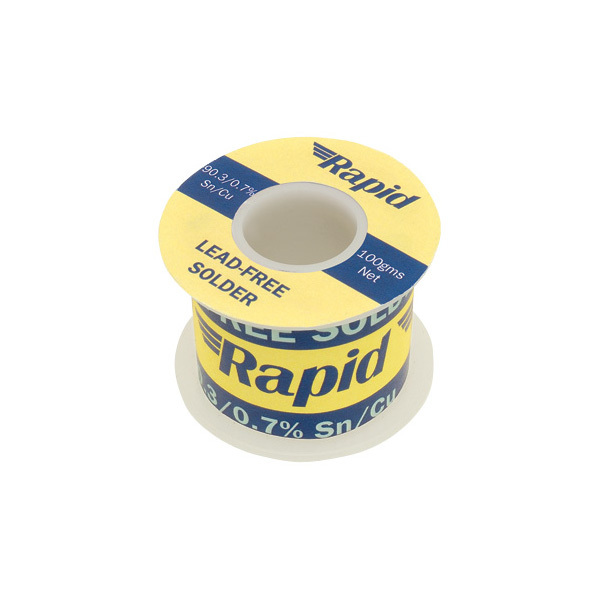 Economy lead-free solder with flux cores. Tin Alloy with 0.7% copper. Melting point 227�C. Replacement push in bulb for yard lamp. Suitable voltage from 12v to 18v DC. Operational model gas lights available in three sizes, 38mm, 44mm, 65mm. Suitable voltage from 12v to 18v DC. 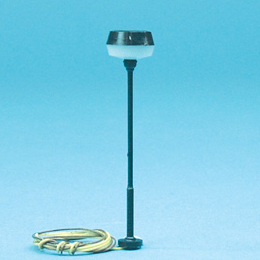 Operational model modern street lamp available in 62mm height. 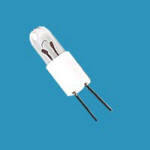 Suitable voltage from 12v to 18v DC.